Staff Sgt. 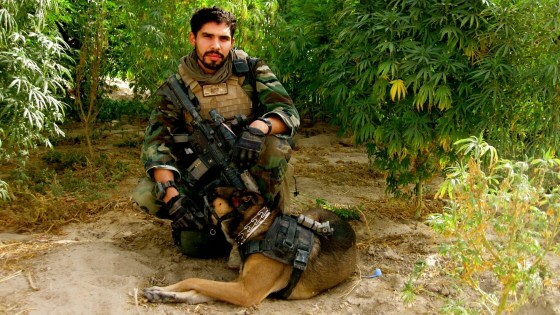 Christopher Diaz, pictured with Dino, his military dog. 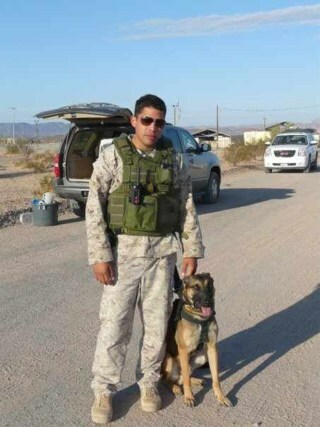 Dino was with the Marine when he was killed by an IED in 2011. Parents of a Marine who was killed in Afghanistan have adopted the bomb-sniffing dog that was with their son on his final mission. Staff Sgt. Christopher Diaz’s parents took in Dino, a 6-year-old Military Working Dog, on Saturday after a brief ceremony at Camp Pendleton, where the canine was discharged from active duty, the Associated Press reported. 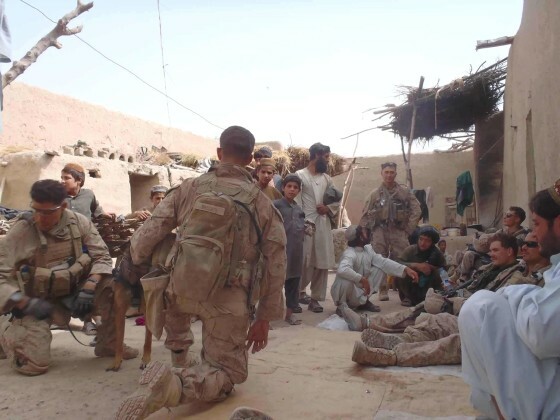 Dino was with Diaz, 27, on Sept. 28, 2011 when the sergeant was killed by an explosive device as he rushed to aid a fellow Marine during a raid in Helmand province. The Marine’s father, Salvador Diaz, reached out to the military shortly after his son’s death to see about adopting Dino. They had to wait about three years to take in the dog, first because he was young and still able to serve, and later because he needed to pass behavioral tests, Salvador Diaz said. It was well worth waiting, Salvador Diaz said. Now Dino is settling in well with Salvador Diaz and his wife, Sandra, in their El Paso, Texas home. Staff Sgt. Christopher Diaz pictured in Afghanistan in 2011. Dino was their son’s constant companion ever since 2008, when the young Marine traveled to Israel, where Dino was born, to train alongside the dog in a special off-leash search method. Later the sergeant and Dino trained others in how to conduct searches. “There’s a little language barrier,” Salvador Diaz said, because Dino still responds best to commands given in Hebrew and doesn’t always understand American pronunciation. Even so, the dog is blending right in with the family. He shares a lot of their son’s personality traits, the dad said. “It’s like he has always known us,” Sandra Diaz says of her fallen son's military dog, Dino. Christopher Diaz grew up in Albuquerque, N.M. with his parents and three brothers. Two of his siblings became Marines, like their father before them. Christopher Diaz was a shy child, his father said, but by about his junior year in high school he came out of his shell. He was a snappy dresser, popular with the ladies, and always urging his parents not to sweat the small stuff, his dad said. Staff Sgt. Christopher Diaz left behind two children — Mia Davis, 9, and Jeremy Diaz, 8. The kids will visit their grandparents in Texas in a few weeks, meeting their father’s trusted companion for the first time. “They’ve been calling daily to know how Daddy’s dog is,” Salvador Diaz said. Sandra Diaz said Dino is adjusting well to life as a pet. He isn’t grabbing for things or chewing things up. He plays with his ball, enjoys a walk, naps. “It’s like he has always known us,” Christopher's mother said. Faith, friends and family are helping the Marine’s parents endure, though they will never forget the loss of their young son.